People often ask about pricing, as in what does it cost to have my locks changed, or have a key made? Rather than have you spend time calling around for pricing, I have listed below the fees I charge for most standard tasks. That way you have an expectation of costs before I arrive. If I arrive, see something that I think needs doing that we have not previously discussed, then I will talk with you about it, and we’ll agree on a course of action. That could be we agree to ignore it or take the necessary steps to repair. 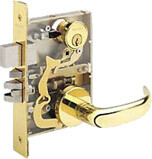 There are unscrupulous locksmiths who will quote a very low price over the phone, and once having arrived at your home, (possibly with the lock in question torn apart) begin raising the price. This is especially frustrating for the consumer when it’s an emergency, after hours, or a holiday. I know one situation in which a predatory locksmith charged over $900 for a house rekey—a job for which I would have charged $175. To avoid this or other unpleasant scenarios, I suggest everyone have the number of a reputable locksmith handy/available. Most of us go many years without needing one, but when the time comes (especially in an emergency), having contact information for a reputable locksmith can save you the hassle and possible financial consequence of hiring an unknown or unethical person. There are two parts to the pricing; the service call and then a task specific fee. Both are summarized below. Rekey all additional locks $12/ea. Duplicate/cut keys (most standard keys) $2.50/ea. Labor for tasks not listed above $40/hr.